I’ll always remember John and Colm Meaney (in Con Air) who, very openly, call out John Cusack’s characters for their John Cusack-ness. I know he’s Frazier’s father too…..but he’ll always be Diane’s dad to me. I own it, still a sweet story, and the cast was wonderful. He was so good in this. This is my favorite movie. .I’ve watched it over 50 times..and some of the best scenes are those between John and John. Jon O’Neill I MAKE THEIR LIVES BETTER!! I still need to find/make a gif of that. Or a perfectly timed screenshot meme. I loved that guy. 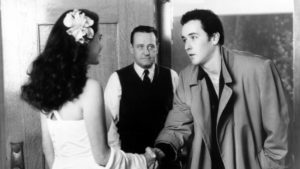 Didn’t watch him much in much else but he was always with me in the Say Anything that’s always present in my head since I was 13. I love this. Even as a 20 year old watching this movie, loving every part of it with great college roommates on an old college house couch repeatedly, I always loved the feature of John’s laugh in the movie. “Give him a pen, he can write to you” classic…. I love this movie….love John’s portrayal of this character …… I love you Cameron Crowe….